When I was a child, my grandparents lived on a golf course. It was a beautiful place, mysterious and sprawling with woods, lakes and paths. A good place to go fishing, only mind the snakes and snapping turtles. Not far from my grandparents’ house, a path went through a dense patch of woods with a stream running through it. We called it the Spooky Forest. It was generally agreed upon that straying from the path was a bad idea. Far be it for me to write something that doesn’t have woods in it–the creepier the better. So I’m honoring my childhood haunt with today’s release of the Second Edition Ebook of Wizards Woods and Gods, a collection of twelve dark fantasy tales exploring the mysteries of the Otherworld through tree and animal lore, magic, cosmos, love, war and mysticism. These stories reflect some general themes, as follows. Click on the story links for descriptions, excerpts and illustrations. The forces of creation exist in all things, flora and fauna, seasons, worlds, every act of the heart, every loss and turn of a mind. Light comes from the Void and surprises its creators with something new and heretofore unknown. In “The Trouble with Tansy” and “The Fifth Verse,” two women, a mortal and an immortal, discover the power of creation through the inexorable forces of death. Wizards call him sioros, an immortal predator with the body of a male god, towering black wings and the claws and fangs of a mountain cat. To lay eyes on him means either heartbreak or death depending on how the winds blow that day. In “Eating Crow” and “Marked,” one woman attempts to elude the hunter and pays with her heart; the other tries to bargain with him and pays with her life. A sun’s cycle had passed since Solfaron set its predatory gaze on the Glass. With a warrior’s edgy calm, Liros had told Pael that he lived on the wrong side of the border, in the wrong land, with his forest, his visions, and his sacred observatory. But Pael cared little for his older brother’s admonitions. He loved the land of Moth with all his heart; he had touched the towering crystal observatory of the Glass and he knew what it could do. Solfaron could try to take it but they would fail. Only his love for Liros kept Pael concerned with it at all. War did not affect him, a mystic living in the wilds like an animal. War destroys the fortresses of innocence with the awesome indifference of a natural force such as an earthquake or a hurricane. Whatever its causes or intentions, it changes things. Permanently. But while it can drive us to the depths of human depravity, sometimes, as with any traumatic event, it can also awaken us to our potential. In “The Bridge,” “DeathSeer” and “Earth Blood,” a priestess and two warriors find themselves caught in wars that strip the veils from their eyes to reveal their true natures. Between the gnarled, twisted trunks of two oak trees loomed a black opening. Roots draped over and around the darkness inside as if to feed on it. Sethren walked slowly, his body aching and his heart pounding, until he stood at the threshold. Cool air breathed from the shadows. He could barely discern the images in the cracked stones for the moss and ivies clinging in the lines—except for one at the top: an interlocking five-pointed star with a black stone eye in the center. Five points, five lines and a raven’s eye. Some say that everything we know is the dream of a god. I am fascinated by the idea of a sleeping god, a being who comes from and must occasionally return to the quiescence of the womb, as all things do, for healing, renewal and rebirth. In “The War God Sleeps” and “The Origin,” one god is awakened by a mortal; the other, by his own creation. She stirred, beamed a glorious smile and waved. Love, being every bit as powerful as, if not easily compared to, a creepy forest, naturally rears its head in most of these stories. 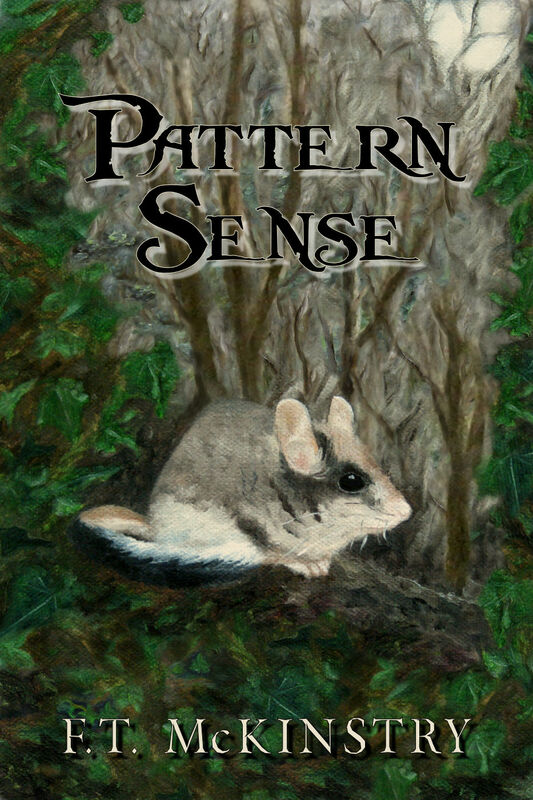 But in “The Om Tree,” “Pattern Sense” and “Water Dark,” an assassin, a knitter and a wizard are caught up in love’s brambles and encounter their powers there. Long ago in a life far away, I began conjuring up the world of Ealiron. 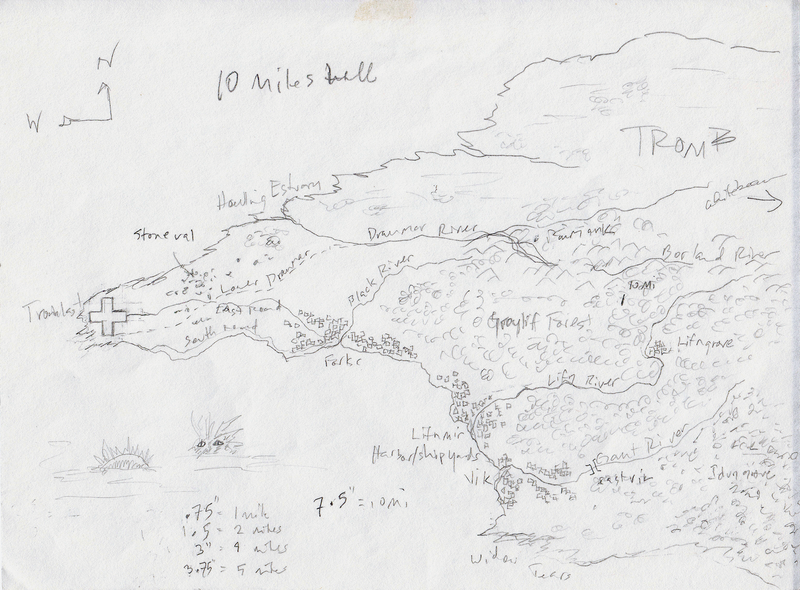 As it emerged from the mists, I sketched maps. This was useful for figuring out where things were relative to each other, how far, in what kind of landscape, etc. In time these drawings grew and became more complex. Writing the stories helped to draw the maps; and drawing the maps helped to write the stories. This is a fascinating thing about art and writing. They nourish each other. I also dabbled in Celtic art, and enjoyed embellishing my maps with it. 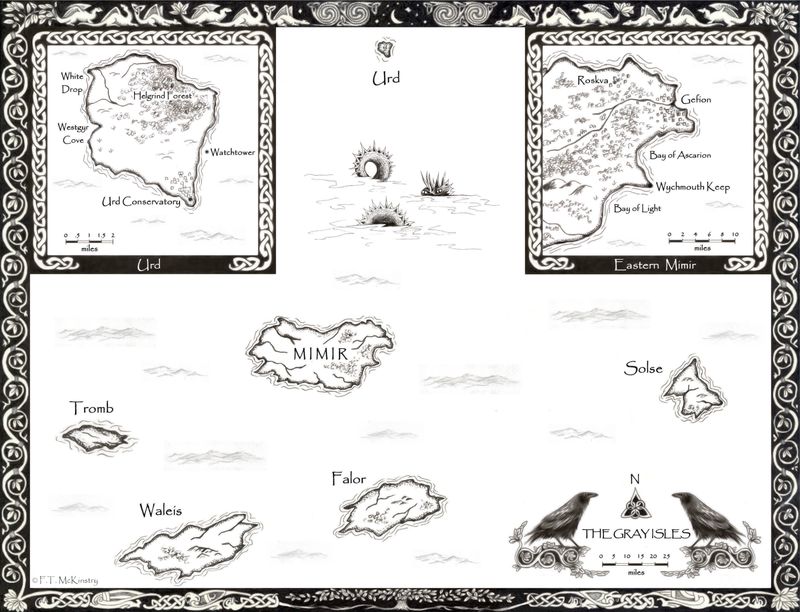 The first map came with Book One, The Hunter’s Rede. This story takes place in the Ostarin Mountains, which sprawl across western Sourcesee between the borders of Faerin and Tarth. Our hero, Lorth of Ostarin, is plying his trade as an assassin in the watery realm of Tarth when an eerie summons prompts him to defy his royal employers and return to his homeland. He finds it overrun by a cruel Faerin warlord who is set upon casting down everything Lorth holds dear…or so we think. 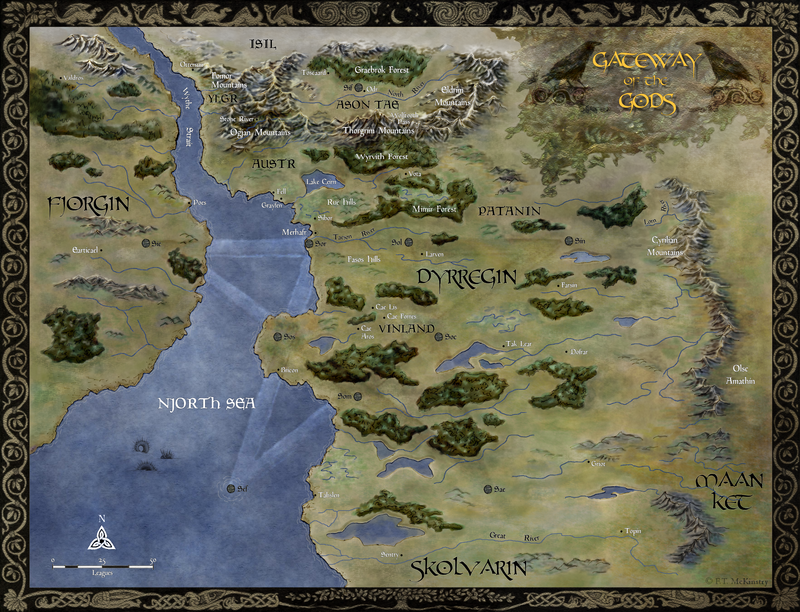 In Book Two, The Gray Isles, we journey east to an archipelago of backwater isles roughly a thousand miles east of Sourcesee. The Gray Isles are steeped in mystery and legends, most of which are not legends at all but the frightening truth. 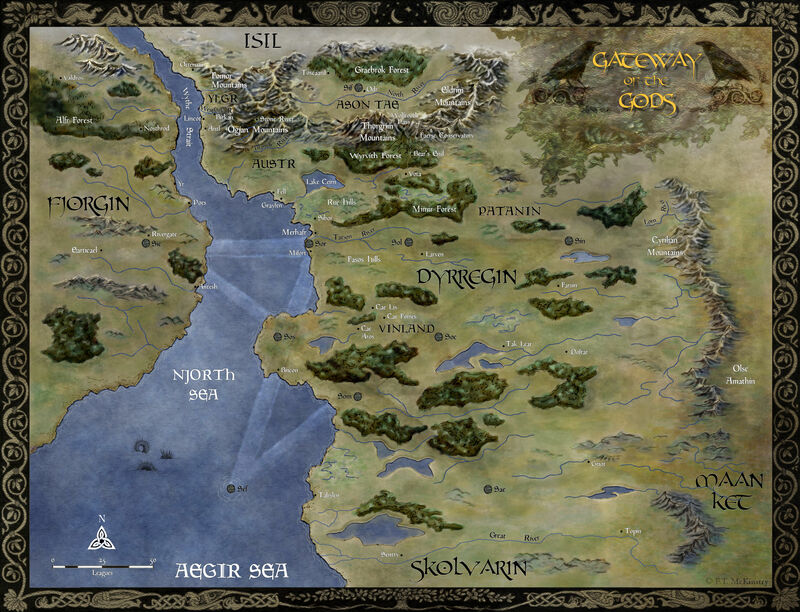 The first map shows the Gray Isles relative to Sourcesee and the realms south over the seas. The second map shows the isles themselves. 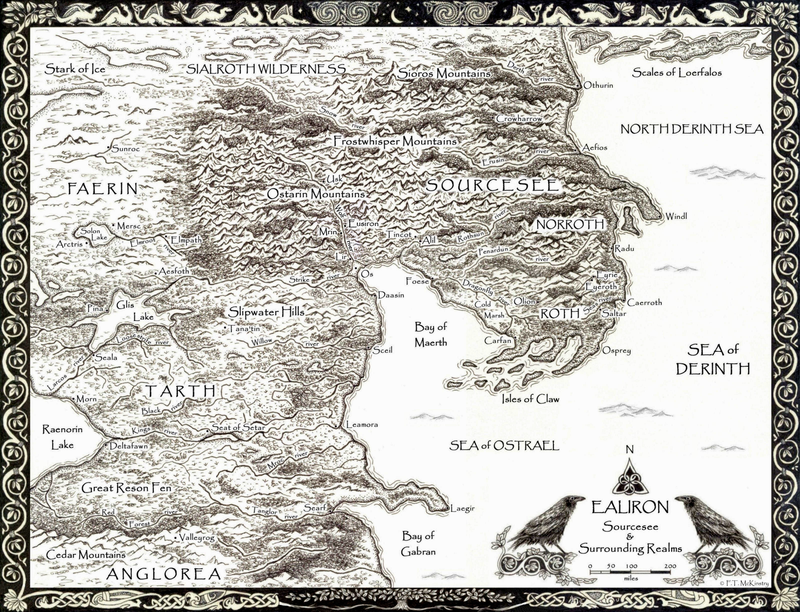 This one includes close-ups of the places where this story happens: Urd, home to an ancient conservatory for the Keepers of the Eye, wizards who maintain balance in Ealiron; and Mimir, the ruling seat of the isles. Here lives the Master of Wychmouth, a vain wizard of the Keepers’ highest order, who nearly sees the realm destroyed by one of the aforementioned legends itself…which you’ll notice skulking in the water just below the isle of Urd (no coincidence, this). 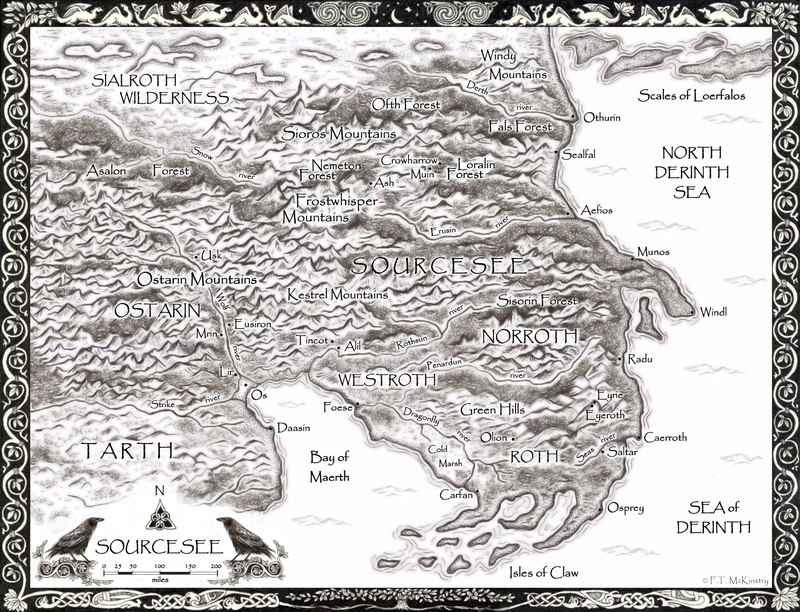 The map for Book Three, The Winged Hunter, focuses on the realm of Sourcesee. This story involves the citadel of Eyrie, the ruling seat of the Keepers of the Eye, in the southeast; and Loralin Forest, five hundred miles northeast of Eyrie. In Loralin, near the village of Crowharrow, lives an old wizard in his domain of Muin, an ancient castle shadowed by an immortal’s curse on the women in the old wizard’s bloodline. This immortal, a ferocious yet beautiful creature, lives in the Sioros Mountains northeast of Loralin, which are named after him. 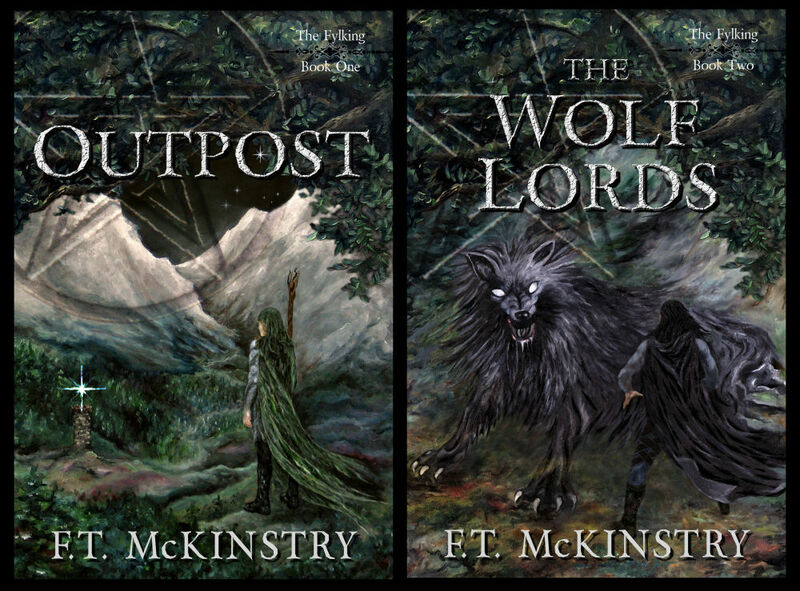 The Chronicles of Ealiron includes four standalone heroic fantasy novels that follow the exploits of Lorth of Ostarin, an assassin and wizard who serves the old powers. 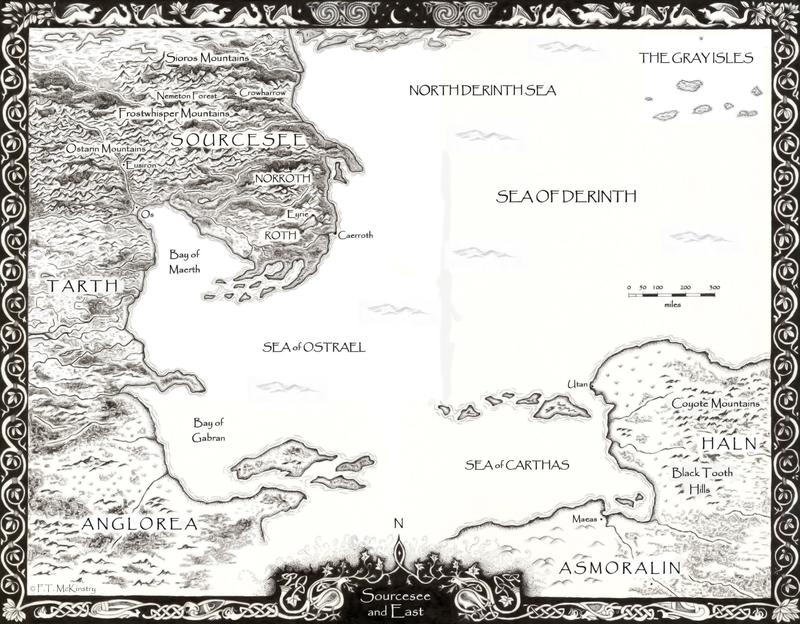 Maps are accessible online through the “Chronicles of Ealiron” drop-down menus and the “Maps of Ealiron” menu, both on the sidebar of this page; and on the URL pages for each book. You’ll also find links in Chronicles of Ealiron: Terms and Places. Wizards, Woods and Gods is a collection of twelve dark fantasy tales exploring the mysteries of the Otherworld through tree and animal lore, magic, cosmos, love, war and mysticism. I did a series of pen and ink illustrations inspired by some of these stories. Click on the images to zoom and get information about each story. 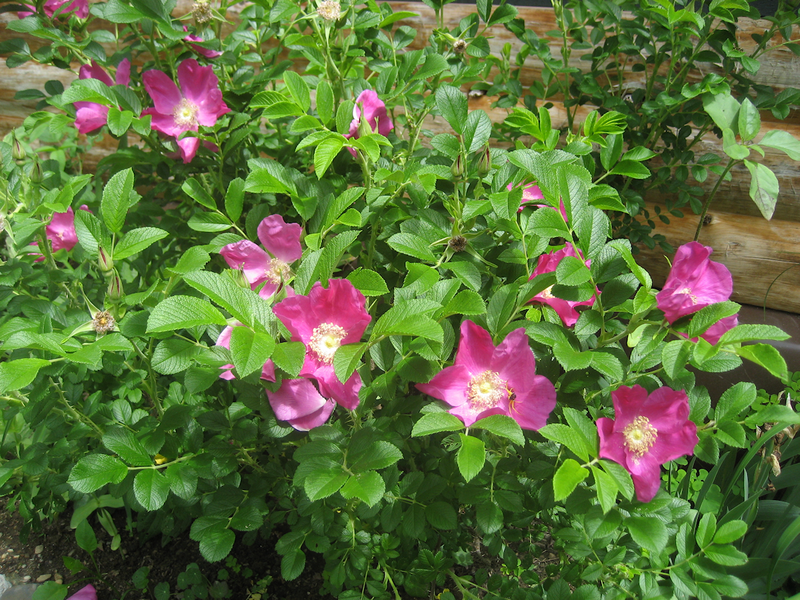 Rose Moon is a traditional name given to a full moon in Midsummer. She gave him black fruit from thornbushes. In ancient times the sun played a divine role, being the source of life and the origin of the festivals that mark the quadrants of the year. On the summer solstice the sun is at its peak before its descent into darkness. In the north where I live, the longest day has a visceral quality. The mountains and valleys are lush and teeming with life that seems to sigh as the day turns, bringing a sense of completion. Before long the afternoon shadows will lengthen, the leaves will fly and the nights will grow cold as the sun withdraws for another winter. I keep part of the sun in my heart on this day so that in winter, when it’s twenty-five below zero and the sun feels like it’s in another dimension (when it shines at all), I have hope. The power of the seasons fascinates me and finds its way into my stories. The warmth and power of Midsummer has a special place in The Winged Hunter, Book Three in the Chronicles of Ealiron. This story revolves around a wizard’s hall called Muin in the heart Loralin Forest. The Hall of Muin is a Sun Key, or solsaefil in the wizard’s tongue. The design of the hall, including its layout and the placement of crystals in odd locations, uses the Waeltower, a tall, faceted garnet tower that focuses earth energy, to direct the light of the sun into geometric patterns that illuminate physical locations. The Sun Key marks seasonal events such as solstices and equinoxes. On one particular Midsummer night, the summer solstice aligns with the Rose Moon and this opens a portal to the Old One, a primordial goddess of nature, life, death, and transformation. By the power of the Sun Key, a gate is projected into the woods on the south side of the hall. It is said that what happens there depends on the heart of the perceiver. Midsummer corresponds to the maternal aspect of the Old One, she who nurtures, grows, gives birth. Gardens bloom and flourish. In this story everyone has something to hide and something to heal, and the Rose Moon illuminates the landscape to powerful, transformative and devastating ends. For more information about this and other wizardly things, check out Chronicles of Ealiron, Terms and Places. Three hundred years have passed since half of Earth froze, and the human race has settled other planets under the supervision and control of a military contractor that harnessed the powers of the higher mind. 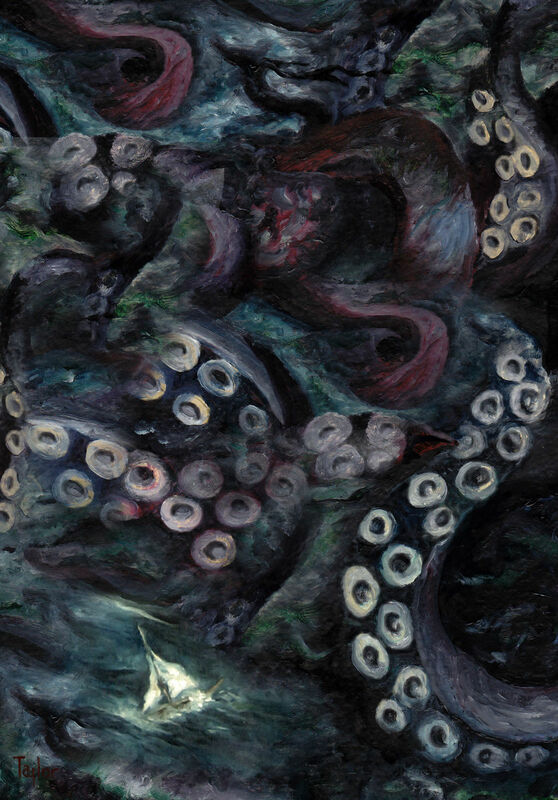 But when the daughter of a warrior clan who made her fortune in the contractor’s service discovers a dark secret beneath their dominion, she must learn to fight like the old gods. 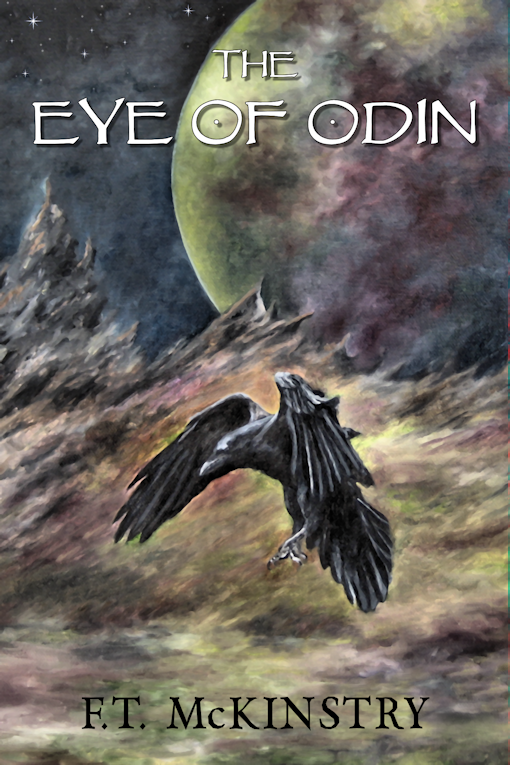 This short story is woven into the Norse myth of Odin, the one-eyed, all-seeing god of war, magic and wisdom. He is a complex figure, associated with poetry and inspiration, madness and battle fury. He is also a shapeshifter and considered fickle, not to be trusted. No one knows whose side he’s on. Violet Scott took a deep, uneasy breath as the gray-green orb of Asgard, the home of Odin Systems, appeared in the sentient darkness of space like a gaze. To calm herself, she mentally recited a tale that her grandfather, a professor of ancient Earth religions, had taught her as a child, about a Norse god who had sacrificed an eye to gain the wisdom of ages. He is warrior, he is poet, he is mad. He is Odin, the Wanderer. The lavender light behind her eyes turned incandescent white as she entered orbit. A gray shadow crossed it, a raven moving over a twilit cliff face. She brushed it off with a chill on her heart that crept down into her womb like a spider. She held her mind in a state of receptivity, a controlled opening surrounded by a steely network of supposition. Sprays of stars arced over her ship, a Fenrir fighter, glistening and fell in the emptiness between worlds. The soft, warm interior of the hull surrounded her body like the guts of a wolf that had consumed her. A long silence caused her to realize she had just unthinkingly given them the title of Valkyrie, which was no longer hers. Violet eased back in her seat, spinning complex webs of geometry, the equations of a landing. She closed her eyes as the forces of entry gripped the hull and streamed over her mind in streaks of red, orange and nonlinear questions. A prickle raced up the right side of her spine. He rules over his great Council of Twelve, in his Hall of Gladsheim. Gladsheim. Not Valhalla, the hall in the east where the warriors were housed and trained; not Valaskjalf, the hall in the west that coldly ensconced the Systems Controls Tower. Not a good sign. She focused on the Light with an iron hand. Light fueled her ship; Light from every sun, color and tree; Light, the foundation of the cosmos. She gazed through the center of the star, spiraling in as darkness closed a fist around her. But she would not look into the Void. Not here, in sight of the Judges.